The Loch Ness Monster is not the only mythical creature to have a longstanding place within Scottish hearts. 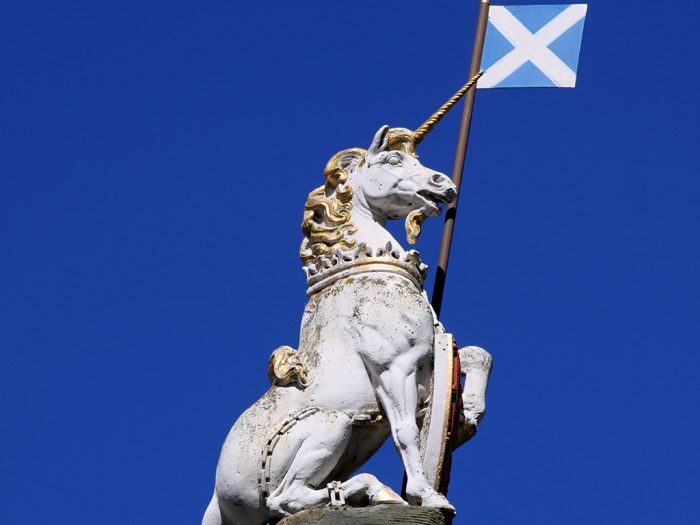 It is in fact the unicorn that is the country’s rather unlikely national animal, after first appearing on an updated royal coat of arms for William I, King of Scots, in the 12th century. Some 300 years later, King James III opted to include the unicorn on Scottish currency. Under King James VI, Scotland’s royal coat of arms featured two unicorns supporting a shield, a testament to the country remaining unconquered. When he oversaw the Union of the Scottish and English crowns in 1603 (and duly became King James I of England too), however, a change was required. In order to symbolise the improved relationship between the two nations, the royal coat of arms was reformed and one of the unicorns was removed in favour of the national animal of England: the lion. According to Celtic mythology, these two animals were traditionally enemies, making this unlikely union all the more symbolic. The unicorn ruled by reason and the lion ruled with strength, meaning that the two animals ruling side by side were seen to be an excellent combination. Likewise, the unicorn is also considered to be a symbol of strong masculinity yet also chivalric behaviour. The animal’s horn is used as a weapon in Celtic mythology, while it was also thought to possess healing powers –these two traits demonstrate the creature’s ability not only to be dominant, but also be led by compassion and reason. All of these characteristics represent how, traditionally, the Scottish wanted to conduct themselves in battle, acting in a fair and justified manner. The unicorn remains very much a symbol for Scottish morals and national pride today. Examples can still be found in architecture across Scotland, particularly in the capital with prominent statues outside the Palace of Holyroodhouse and St Margaret’s Chapel at Edinburgh Castle. A white unicorn sits atop the Mercat Cross in Edinburgh’s Parliament Square, while similar beasts can be seen on the market crosses in Dunfermline, Melrose and more. A statue of both a unicorn and a lion can be found either side of Edinburgh’s Melville Drive at the western end of The Meadows. In the run up to the vote that saw 55.3% vote against independence, unicorns were a feature of parades in favour of the proposal. The horned creature was once again a passionate symbol of resilience, independence and patriotism.